Exposure to potentially hazardous blood is a very real concern for anyone working in a youth-focused or community-based organization. When a child gets a bloody nose or someone stubs their toe on the diving board you might be asked to clean it up. After all, we don’t want the general public to be exposed to bloodborne pathogens. Always assume the blood is infected with a dangerous disease like HIV, Hepatitis B or C.
Have the right cleanup equipment and use it properly. Bodily fluid spills may require some specialized equipment depending on their location within the facility, the size of the spill and the type of spill, but most can be cleaned safely using the equipment recommended in OSHA’s Bloodborne Pathogen Cleanup Kit. Blood isn’t always going to cooperate. Sometimes it won’t be easy to simply block off an area and follow general blood cleanup guidelines. Read through the following descriptions to ensure you’re prepared for any blood cleanup experience. A hard, non-carpeted surface is the most common setting for blood spills. These surfaces include tile, ceramic, vinyl, linoleum, metal, wood, cement, and any other non-absorbent flooring such as a pool deck. Cleaning up blood and other bodily fluids off these surface types is easier than absorbent surfaces, but there are still important steps for you to consider. Block off the area until cleanup and disinfection is complete. No visitors or unprotected staff members should be able to access the area. Wipe up the spill as much as possible with paper towel or other absorbent material. Gently pour bleach solution – 1 part bleach to 9 parts water – onto all contaminated areas. Let bleach solution remain on contaminated area for 20 minutes and then wipe up remaining bleach solution. All non-disposable cleaning materials such as mops, brushes and rags need to be disinfected by saturating with a bleach solution and then allowed to air dry. Remove gloves and place in a garbage bag with all other soiled cleaning materials. Double bag and securely tie up garbage bags and discard. Blood spills on carpeted floors are some of the most difficult to clean up due its absorbent nature. 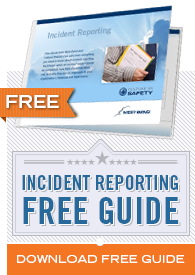 The majority of buildings contain at least some amount of carpeting, which is why it is important to know how to respond to spills in these areas. Many of the procedures for cleaning up blood on carpet will be the same as any other area, but there are a few additional concerns. In addition, there is no way to disinfect carpet completely so the best option is to sanitize as thoroughly as possible. Work Quickly: Blood or other bodily fluids can harden or set up quickly on carpeting, making it much more difficult to clean. Respond quickly, but make sure to follow all safety precautions like wearing appropriate PPE, securing the area, and ensuring the injured individual is safe. Use Appropriate Products: Bleach and other decontamination products can damage or destroy carpet. The best way to clean these areas is to use manufacturer approved carpet shampoos and cleaners. Make sure you select a product with some anti-microbial properties to help sanitize the area as thoroughly as possible. Another recommendation is that after the area is cleaned and dried repeat the process once or twice more since the absorbent nature of carpet can still conceal some pathogens. Steam Clean: Depending on the nature and size of the spill, it is advisable to perform a steam clean of the carpet. Steam cleaners will clean, remove debris, and sanitize carpeting more completely than conventional washing. Although there is some additional cost to steam cleaning, it is the best way to protect against bloodborne pathogens. Change Carpet Tiles: Removable carpet tiles are a great way to protect against exposure to bloodborne pathogens. Carpet tiles are often less expensive than traditional carpet, and if a certain area becomes heavily soiled with blood they can easily be removed and replaced. If your organization is equipped with carpet tiles be sure to dispose of them properly after being saturated with blood or any other potentially infectious bodily fluid. The basic protocol for cleaning carpets and removing the threat of bloodborne pathogens is listed below. Please note that even when these steps are followed there is no guarantee that the threat of bloodborne pathogen exposure is 100% eliminated. Put on Disposable Gloves: No matter what type of surface you’re cleaning, always put gloves on first. Contain the Spill: After a spill, it is important to keep it as contained as possible to avoid allowing the affected area to spread. Create a barrier around the spill with an absorbent material. Initial Disinfect: Once the area is contained, spray the affected area with an appropriate carpet detergent to help kill some of the surviving pathogens. After spraying the area, allow it to sit for 10 minutes so the disinfectant has time to work. Blot up Excess Fluids: Use disposable towels or rags to blot as much excess fluid as you can and then carefully dispose of the soiled rags in a sealable bag. Extract Absorbed Fluids: The carpet will absorb some of the fluid so removing them will be the next step. Use a wet-vacuum to thoroughly wet and remove any fluids. Repeat the process of wetting and suctioning several times. While wetting the affected area be sure to prevent any water from spreading beyond the initial boundary. Re-disinfect: After vacuuming, thoroughly re-saturate the area with an appropriate disinfectant. Follow your carpet manufacturer’s recommendations since certain products can damage carpet fibers and dyes. Let Sit: After completely disinfecting the area, allow the disinfectant to set and work for up to 20 minutes to make sure it has the full effect. Third Disinfect: Repeat the previous two steps of disinfecting and then allowing to sit for 10-20 minutes. Rinse: Once the final round of disinfecting is complete, rinse the area one last time to remove any remaining detergent or disinfecting solution. After rinsing, wet-vacuum the area. Wrap up: After the area is clean, properly dispose of all rags and PPE contaminated by the spill. In addition, thoroughly clean all other equipment used during the spill cleanup. Like bodily fluid spills on carpet, spills on furniture are difficult to clean as well. There are, however, certain steps you can take to make sure it is as clean and safe as possible. As is the case with blood spills on carpet, it is important to contain the spill as quickly as possible. Cleaning blood off of furniture depends on what type of furniture is contaminated. Cloth furniture needs more treatment than wood or metal furniture. Depending on the type of cloth furniture and the degree of the spill, the best cleaning method is to remove the cloth covering, if possible, and launder it by itself on a warm wash cycle. If the cloth furniture does not have a removable cover, then it is best to treat the spot as you would a blood spill on carpet and disinfect, let sit, and repeat several times. There are also professional services that can clean furniture much more effectively and thoroughly if the spill is severe enough. Blood spills on metal and wood furniture are not as laborious as those on cloth furniture, but it is important to point out that bloodborne pathogens are still a threat. 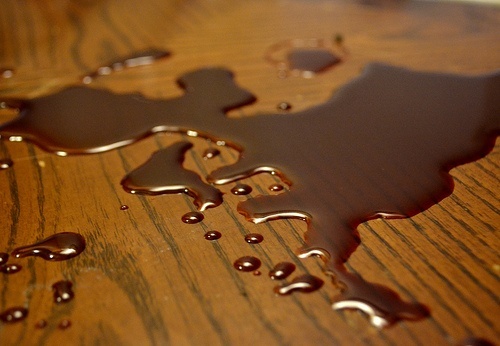 Metal, wood and any other non-porous furniture should be cleaned just like a blood spill on a non-carpeted surface. For blood in the pool, there is no action required other than attending to the injured individual and making sure the blood does not contaminate anywhere else. A properly maintained pool contains enough chlorine to kill any bloodborne pathogens. From the CDC: Germs found in blood (for example, Hepatitis B virus or HIV) are spread when infected blood or certain body fluids get into the body and bloodstream (for example, by sharing needles or by sexual contact). Chlorine kills germs found in blood and CDC is not aware of any instances in which a person has become infected with these germs after being exposed to a blood spill in a pool. Does chlorine kill the germs in blood? Yes. These germs do not survive long when diluted into properly chlorinated pool water. Swimmers want something to be done after a blood spill. Should the pool be closed for a short period of time? 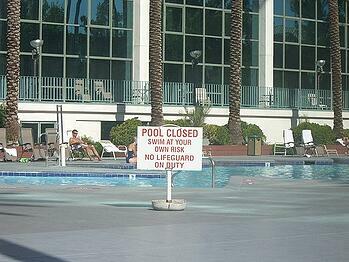 There is no public health reason to recommend closing the pool after a blood spill. However, some pools choose to do so temporarily to satisfy patrons. Blood spills outdoors present a unique set of challenges. Cleaning bodily fluid spills from dirt or grass is difficult, but since there is still a potential for exposure there a few measures to take. The easiest step is to re-locate whatever outdoor activity caused the exposure and to block off the affected area. The area should still be disinfected as completely as possible with some form of disinfectant (like bleach) and then thoroughly rinsed with water. Take care to keep the exposed area contained. As with all blood cleanup procedures make sure to wear appropriate PPE and to dispose of it properly after cleanup.